Skip to 24:30 if you are only interested in the discussion. You're not alone in your quest to transform to a culture of collaboration, mentoring, and transparency! The InnerSource Commons community is sharing successful approaches, challenges and is working together on solutions. To hear about how you benefit from this community or how you can participate, join the Solving InnerSource Problems webinar. Two ways you can tap into the InnerSource Commons brain trust? Send a description of your biggest inner source challenge (by Direct Message in slack) to Tim Yao (@thyao) or Erin Bank (@erin_m_b) by COB 2017-03-10 and be a part of the conversation! 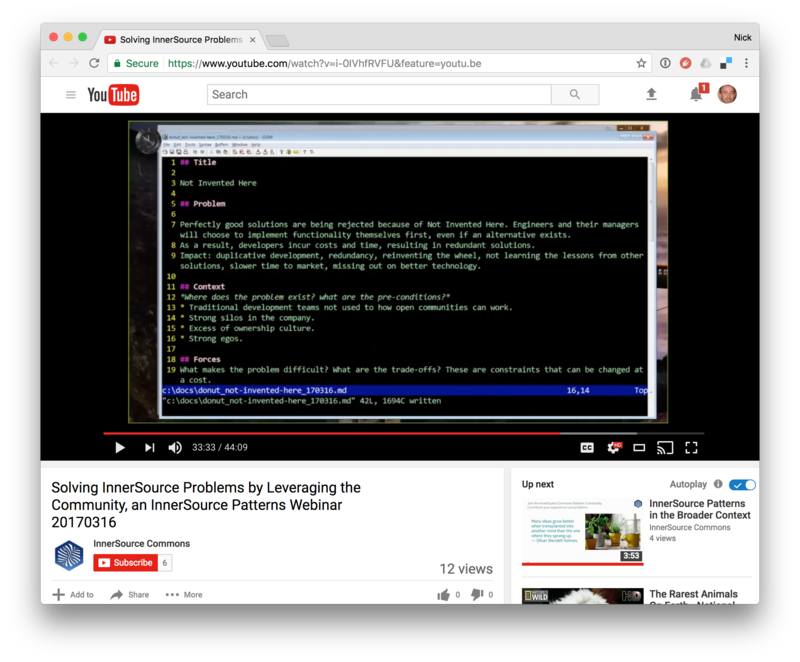 Be one of the first to check out the NEW Inner Source Patterns YouTube Channel.